The only way to describe our most recent project is “BIG.” Enormous, huge, humongous would also do, but you get the idea. By comparison the HZ-600 is nearly double the size of our largest standard size machine the HZ-330. The customer for this project makes high-end drains for high-rise housing buildings in New York. They originally were impressed with MFI’s process on smaller square covers. After visiting the lab and testing the process on longer pieces, they wanted to finish parts up to 60” long. The standard HZ-330 has four barrels that are each 42” long and 12” wide. 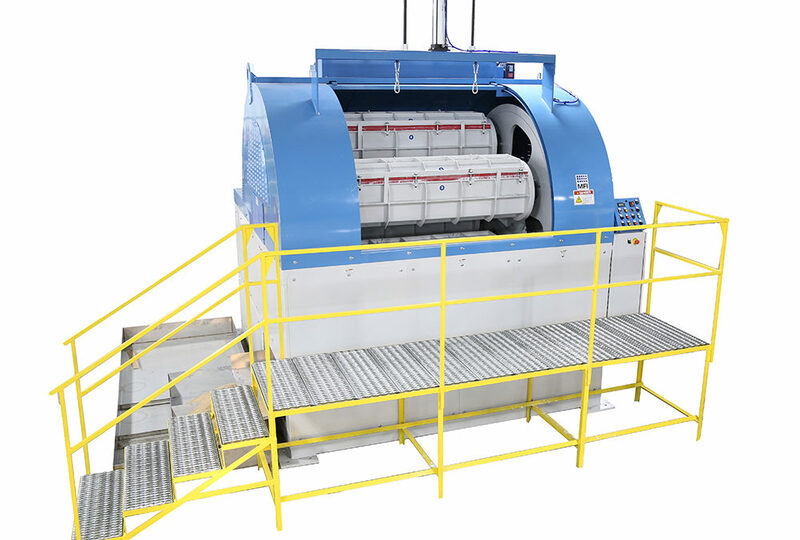 This meant in order to fulfill the customers need, MFI needed to create a custom machine. The customer agreed to the plans and decided the finish was worth the cost of the custom engineering required in August of 2018. MFI started working with various local vendors to help build all the framework and components required for the giant machine. Piece by piece the over sized components started arriving on site for assembly. Through some minor modifications and testing, the machine was running parts by the end of December. Each barrel is 62 inches long and 12 inches wide. The main drive motor is 30 horsepower and there is also a barrel rotation motor and media removal feeder system. Mass Finishing anticipates this won’t be the last HZ-600 to roll off the assembly line. Other customers and distributors are already expressing interest in the possibilities the larger capacity presents.